Rauf Bolden: Should you stay in Orange Beach during a hurricane? Hurricane season started June 1 and officials said the Atlantic could see four major hurricanes this year. Living on intimate terms with hurricane disaster is something Orange Beach residents accept, being mentally prepared, understanding how hurricanes work, securing their property against flooding, actively debating the decision to evacuate or not. The community conversation is often peppered with residents’ stories of past evacuations, like not being able to get back after Hurricane Ivan (September, 2004), shading residents’ decisions in favor of staying. “The majority of natural disasters over the last ten years involved flooding. Flood related events including hurricanes, severe storms, heavy downpours, and others, accounted for more than seven out of ten presidential disaster declarations.” according to a report from the Federal Emergency Management database of Disaster Declarations. “Summarizing [the number of]Presidential Disaster Declarations (PDD) from 2008-2017: 73 percent were Flood Related, and 27 percent were Non-Flood Related,” according to a report on Vox. For those planning to stay in Orange Beach during a hurricane, reviewing your family’s plan is essential, taking input from each family member, including the children, allowing them to buy-in as a main component, helping provision food, water (filling the bathtubs), paper products, pet treats, medicines, bandages, disinfectant, propane, and fuel. “I moved here from the frozen tundra of the midwest seven years ago at age 50. I live on the beach. I’m a property manager there. I’ve got a lot personally and professionally invested in Orange Beach, but if an evacuation is called for during the next hurricane, I will most certainly leave,” said Sarah DeLazzer, a condo resident. Remaining during a hurricane is the biggest game-day decision of your life, knowing your vessel or home is fortified and up to the task, inspecting its structural integrity for weathering the storm will give you confidence, not arrogance. You must feel self-assured, knowing you will not need to call 911, because they are not coming! Carol Belmonte, a 30-year veteran of hurricane evacuations in Orange Beach will stay, having purchased her home in Bear Point 25-years ago. She said, [when you leave]it takes two weeks to get back on the island. They let all the FEMA people and contractors on before us [home owners]. As illustrated throughout Hurricane Florence (September 9, 2018) preparation for flooding is key. The Baldwin County Emergency Management Agency (EMA) has the most comprehensive resource database for Orange Beach residents, supplying information for family, home, business, special needs, the elderly, and pets (see video). “The best thing I’ve seen all day [Hurricane Florence] was three households of these older neighbors pitching in to clear a tree from another neighbor’s front yard [near Wrightsville Beach, North Carolina]while the storm was still very active,” according to a report by Jerry Tominack on Fox News. “We’ve not had much wind [Hurricane Florence] but all ditches are full and the rain isn’t really stopping. It just keeps sprinkling between short heavy rains. We’re getting prepared to help folks from flooded areas,” said Ann Slaughter in a telephone call from her home in the small hamlet of Haw River north of Graham, North Carolina. The public-awareness campaign ahead of Hurricane Florence [September 2018] was stunning, giving people adequate time to evacuate. The government changed lanes on the evacuation route, accommodating outgoing traffic. This advance-warning system is available in Orange Beach, arming residents with reliable information on wind strength and storm surge. If you choose to stay, understanding how tropical storms develop, feeding off the warm waters in the Gulf will give you a mental advantage, during the height of the event. As old sailors say, easterly winds and a falling barometer are the first signs, the weather will get worse. Southerly winds indicate the eye-of-the-storm is to the west of you, and you are in the worst quadrant. Northerly winds show the eye-of-the-storm is to the east of you, and you are in the best quadrant. Westerly winds and a rising barometer are good signs, the worst is over, remembering torrential rains and flooding hold the biggest danger to life and loss-of-property. “Most private insurance policies don’t protect against damage from floods caused by rain, overflowing rivers or storm surge. For that damage, the National Flood Insurance Program, which is run by FEMA, provides most of the coverage,” according to a report by CNN. Perhaps you should buy flood insurance if you live in a hurricane-prone state. Look at all the victims of Florence, Harvey and Lane without coverage. Three 1000-year storms in the past four years is an indicator of more storm-based flooding in the future as the planet’s oceans warm. “’Florence’s heavy rains will cause ponding and flooding in places that neither the FEMA coastal flooding maps or [sic]the FEMA river flooding maps are going to do a good job of predicting,’ said Joe Fargione, science director at the Nature Conservancy,” according to a report on Vox. Luckily we have better pre-storm information than we did during Hurricane Ivan (September 2004), providing accurate five-day assessments for wind and flood preparation, raising the question of why state taxpayers should spend tens-of-millions on a second-evacuation bridge in Orange Beach, knowing there is enough advanced notice to organize your affairs and leave the island. Orange Beach, Alabama Mayor Tony Kennon is obsessed, seemingly clawing at the institutions of government, lobbying any state legislator who will listen for an unneeded bridge west of the Foley Beach Express. Midterm election victories may inspire newly-elected officials, giving them the courage to pause funding for a second bridge in Orange Beach ($87 million in state funds), re-allocating these monies to a multitude of infrastructure repairs across the state. 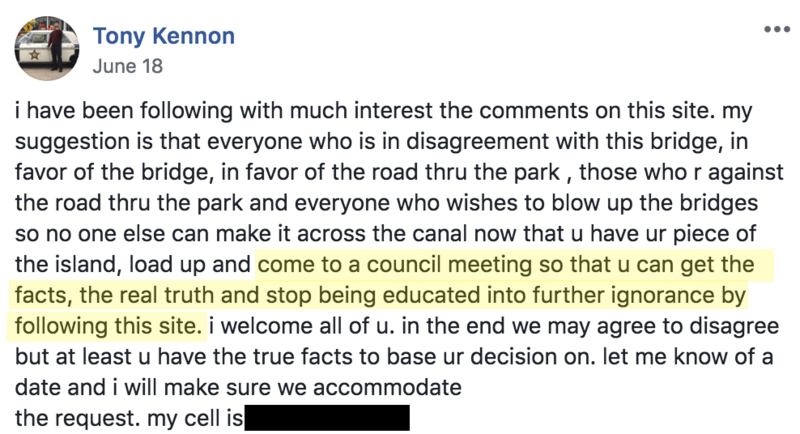 Mayor Kennon said on Facebook (June 2018), “[You should] come to a council meeting so that u can get the facts, the real truth and stop being educated into further ignorance [by this Facebook Group of 2800+ members]”: End The #BridgeToNowhere. In all fairness we should hear him out, perhaps a venue where Mayor Kennon does not hold the gavel, possibly an Alabama House of Representatives Special-Select Subcommittee with power to subpoena email, calendar and text communications, asking what criteria were met, gifting Orange Beach an $87 million bridge, funded by the state. This body would then hand down a recommendation to revoke or endorse ALDOT’s proposed hurricane-evacuation bridge, being a bipartisan-oversight report that legislators can use, justifying their decision. I have too long digressed. Not everyone should stay during a hurricane. Mobile home owners must question the logic of riding-it-out with their families, possibly moving to a city-funded shelter for constituents, providing food and services at no cost to residents, being especially needed if islanders do not have the financial means to support an evacuation-vacation off the island. Today more families than ever will elect to stay during a hurricane instead of evacuating, having built Fortified homes on pilings or on high ground, understanding hurricane dynamics, refusing to wait across the bridge for the all-clear, remembering being stranded for weeks on the other side while water and mold attacked their drywall (Hurricane Ivan, September 2004). Perhaps it is better to stay in Orange Beach, executing your personal-disaster plan. In closing, I would like to share this link of a true story by Jeannette Dean, “We Survived Hurricane Ivan On Our Sailboat [in Orange Beach].” Please stay safe!